Industrial Tooling Corporation (ITC) has now introduced the latest extension to its vast range of hole-making and chamfering products with the arrival of the new CKB Series of R-Cutter tools from BIG KAISER. This new modular round chamfering series is an ultra-high feed front and back radius chamfering milling tool that is available in CKB3 & CKB5 designations. Incorporating features such as a high rake angle to reduce cutting resistance and minimise burr generation, the new R-Cutter CKB Type from Tamworth cutting tool manufacturer ITC offers a unique insert geometry that delivers extreme sharpness. 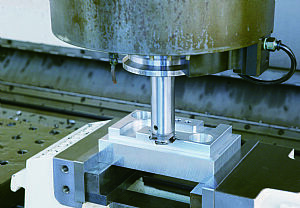 The radius chamfering mill is offered as a four-insert design to machine in the tightest of spaces whilst demonstrating extremely high feed characteristics. The CKB system has a connection that is equipped with a floating drive pin that engages on both sides into respective pockets in the mating part. The tapers on the pins and the angles on the pockets are engineered to permit an automatic balancing of the two resulting torsional forces. Additionally, this connection allows for an array of standard shanks and extensions to be adapted with the cutting heads to create ‘custom’ tools that extend beyond 16 inches. As expected from BIG KAISER, the new R-Cutter achieves all this whilst maintaining impressive damping characteristics near the cutting edge and managing vibration in long-overhang setups. If you would like further information on how you can improve the productivity of your chamfering operations and in the process achieve improved precision, surface finishes, tool life and flexibility, please contact Industrial Tooling Corporation (ITC) for more details.